In this article we’re going to be discussing what the best bass octave pedals of 2019 are. However, before we dive into talking about each of the processors, we want to briefly mention what a bass octave pedal is, the different types that are available, and when you would likely use one. What is a Bass Octave Pedal? What Does a Bass Octave Pedal Do? Bass octave pedals are effects pedals that are able to generate a tone which is an octave above and below the frequency that a bass guitar is playing. Some bass octave pedals are even able to synthesize a greater range, accurately emulating a three-octave range. Traditional bass octave pedals have been monophonic and therefore this has meant that they can only process the effect for one frequency at a single time. 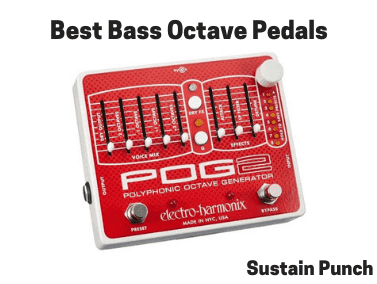 However, due to advancements in technology and the quality of the internal processing units, some pedal manufacturers i.e Boss, have finally progressed to producing polyphonic bass octave pedals. The Boss OC-3 was the first ever polyphonic bass octave pedal and remains a best-seller due to its high sound quality. Bass octave pedals have until recently always been analogue, but due to recent advancements in technology, particularly in the digital audio emulation of the warm analogue sounding effects pedals, digital bass octave pedals have become more available and are an attractive solution. So what’s the advantage of a digital pedal over an analogue one, well digital pedals have several advantages over analogue pedals, being able to process multiple frequencies simultaneously, with most analogue pedals operating on a simple frequency IIRC. Another advantage of a digital effects pedal is that it can more efficiently monitor notes played, therefore making the processing of the desired effect more accurate to the frequency that is being synthesized. Octave pedals monitor the inputted signal from the bass guitar to create a frequency output that is an octave above or below the input signal; The original and synthesized signals are then mixed and sent to the output, allowing you to hear the desired sounding effect. These pedals can be used alongside other bass effects pedals, such as bass preamp pedals and bass multi effect pedals to create an audible masterpiece, both in the recording studio and within a live performance setting. Bass octave pedals are particularly useful to provide a ‘bigger sound’, with the effect also being somewhat drone-like, artificial and unique. Octave pedals are useful in numerous different settings, whether or not the bassist is looking to provide a unique sound to a song, or looking to fill up the mid-frequency range (octave above), or the sub-bass range (octave below), it’s really up to the creativity and taste of the musician themselves. These pedals can be very useful and are more commonly used by bassists on bass solos. So let’s get to it, what are the best bass octave pedals of 2019? The Boss OC-3 dual Worlds first polyphonic stompbox, with the ability to produce notes one and two octaves down. Boss has designed this pedal so that it can be used for both Bassists and Guitarists, with separate inputs for both instruments. 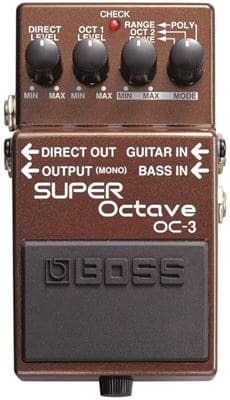 The Boss OC-3 Super Octave Pedal provides users with high-quality octave effects within a single stompbox. The pedal has three pre-programmed modes for users to pick between, including the new Polyphonic Octave Mode (the main difference between the OC-2 and the OC-3), a Drive mode (which adds a distortion effect) and the original OC-2 mode. With the OC-3’s Polyphonic Octave mode, octaves can now be synthesized when playing chords; More aggressive sounds can be had with the Drive mode, which adds a layer of distortion to the inputted bass/guitar signal. This particular pedal is for a bassist who requires an octave pedal that can provide a range of different sounds, with its polyphonic ability mode, alongside the alternative mode which adds distortion to the mix, it really is a versatile pedal, and is a key reason why it’s a best seller. The MXR M288 is the perfect solution for any bassist looking for a reliable analogue bass octave pedal. The interfact gives you control over turning the effect on/off via the easily accessible footswitch; alongside some control knobs that control the following parameters ‘Growl’, ‘Girth’ and ‘Dry’. This analogue pedal is suitable for anyone looking for a more natural sounding octave pedal for bass guitar, with it sounding warmer than a digital pedal such as the OC-3. Based on the success of its predecessor, the original POG, which was a polyphonic octave processor for guitarists and bassists alike. Versatile in its application, it sounded great on a 4-string bass, through to an 18-string guitar. The updated POG2 has all of the glorious features and high-quality electronics of the POG, but also has new integrated features, including the new attack control, to allow users to fade in those smooth swells. 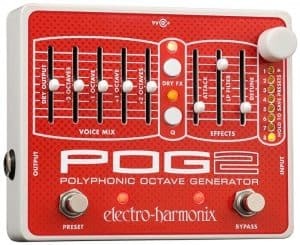 The POG2 also has sub-octave functionality, to synthesize deeper sounds and also has a 2 pole resonant low-pass filter, with two additional Q modes. 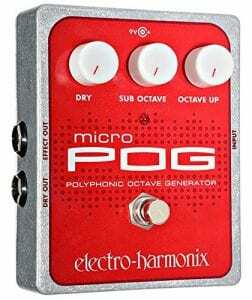 The POG2 boasts an algorithm enhancement that delivers more focused, and accurate harmonic performance, making the overall sound even better than the original POG. The device can be daisy chained with other pedals and power supplies, making it an ideal addition to any effects pedal board. User programming means presets can be saved and instantly recalled, especially useful within a live scenario. True bypass, also incredibly useful when used in a chain, to prevent white-noise. 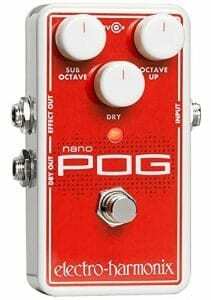 This Nano Polyphonic octave pedal is the smallest addition to the Electro-Harmonic POG family. Similarly to the POG2, this pedal has had a core algorithm update, meaning it has an even better sound than before. The pedal is small, extremely portable and easy to use, with 3 knobs on the front of the interface ‘Sub-Octave’, controlling the level of sub-octave (1 octave below the input frequency) signal which can be heard within the overall mix, ‘Octave Up’, controlling the level of signal one octave above the input frequency, and finally ‘Dry’ which controls the amount of original signal which is present within the overall mix. This polyphonic pedal is ideal for any bassist looking for a medium-sized, strong octave pedal that can deliver octave sounds above and below the inputted signal. This polyphonic pedal is ideal for any bassist looking for a small octave pedal that can deliver octave sounds above and below the inputted signal. This monophonic bass octave processor can provide synthesized tones one octave below the notes that are played, making it ideal for bassists looking to achieve sub-octave frequencies. This processor has two separate smoothing filters enabling the user to tailor the sub-octave signal to your ear, giving you full control of the mix of dry and octave signal. Nice filtering to help blend the dry and synthesized signal together; making for a bespoke mix. 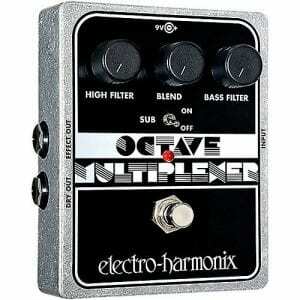 Monophonic octave processor, therefore it can only provide an octave effect on one note at any time. Ideal for someone looking for a reliable monophonic bass octave pedal. The Mooer MOC1 Pure Octave pedal is ideal for the bassist who’s on a slight budget, with this bass octave pedal being significantly cheaper than other pedals including the ‘Electro Harmonix POG2’ and the ‘Boss OC-3’. 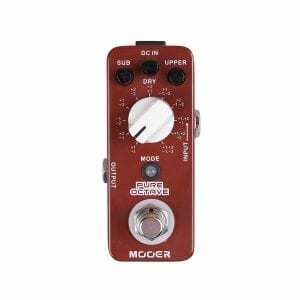 However, this pedal still offers a lot, having 11-octave modes, offering true bypass making it suitable for pedal board integration, and the fact it’s provides polyphonic processing. 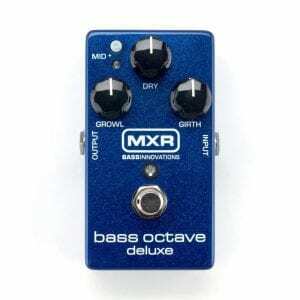 Rather inexpensive compared to other alternative bass octave processors. Does not quite provide the refined octave effect that the POG2 and OC-3 offers. Ideal for someone on a slight budget, looking for an octave pedal suitable for practices and small gigs.